There are far more devices connected to the internet than there are people in the world and that number is projected to grow dramatically in the coming years. Whether you're an individual hobbyist or an enterprise developer, there's a great chance you'll find need for a cloud-based service to listen to the devices in your IoT solution, facilitate communication, and even communicate back to the devices telling them how to behave. That's why there's Azure IoT. 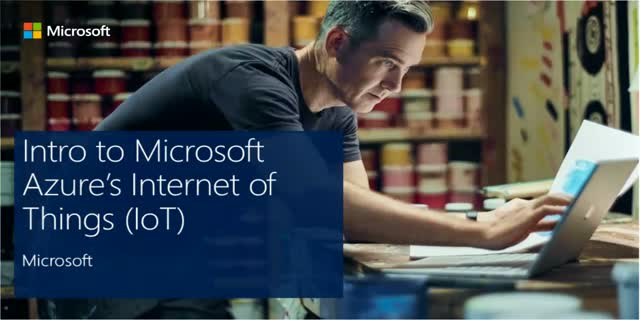 Azure IoT includes the dedicated IoT Hub service, IoT solution templates called IoT Suite, as well as many other general services for processing IoT data and turning them into real business insight. With a little time and learning, you’ll have a service designed to handle massive amounts of communication with devices, but also able to scale down to startup and even hobbyist scenarios. We all know technology can improve the customer experience, but exactly which technologies and how do we apply them? Too much technology, too quickly deployed can result in frustration and failure. • What were their challenges? • Which technologies were key in their transformation? • Who ran the project? • How did they measure success? We look forward to sharing this information with you! What makes a truly successful customer interaction? How does that one interaction escalate into an engaged customer with a positive overall customer experience? And more broadly speaking, how do companies evaluate their overall customer engagement strategies? Michelle Major-Goldsmith and Simon Dorst of Kinetic IT will discuss the role of VeriSM in digital transformation, and its relation to ITIL and other service management practices. Cybersecurity professionals do a great job when it comes to understanding, and mitigating, technical and functional risk. But CEOs and board members tend to think in terms of business risk. This webinar shows cybersecurity professionals how to articulate requirements in business terms. With that knowledge, they can build the case for cybersecurity tools, staffing, and initiatives in a way that business professionals will understand--and fund. Rebecca Herold. Panel: Jake Olcott, BitSight; Todd Boehler, ProcessUnity; Matt Kunkel, LogicGate; Scott Schneider, CyberGRX. As organizations rely on third parties to grow and thrive, they’re exposed to major cybersecurity risks. Mitigating this risk means confronting the potential security vulnerabilities that are present in your third party network, but traditional vendor risk management (VRM) methods are no match for modern threats. According to Deloitte 83% of today’s business leaders lack confidence in third party VRM processes. Join our panel of experts on this CPE accredited webinar to learn how your organization can create a VRM program that’s ready and able to stand up to today's third party threat landscape. • Find out how to gain executive leadership buy-in for your VRM program. • Learn how to perform quantifiable vendor security analyses. • Discover how to leverage Automation to Scale your VRM program. Demonstration of the Badged IT Services Marketplace and beta program overview. May 25th 2018 is the deadline day for achieving General Data Protection Regulation (GDPR) compliance. It is also only the beginning of GDPR. Discover what GDPR means for your organization, how it affects US businesses and why it's important to be GDPR compliant. As organisations seek to improve the quality of IT services, perhaps through SIAM or cloud provisioning, the traditional SLA targets and performance measures we hold dear are no longer appropriate. This talk will look at the common pitfalls and make some recommendations as to measures which will drive the correct behaviours in your internal and external support teams. Cloud…outsourcing…Platform as a Service…all of these could make IT irrelevant, so how do you prevent this? By providing value every day and by running IT as a Business. Great catch-phrase, but what does it mean? In a nutshell: knowing the services IT is providing, what they cost to operate and whether they provide value, and by staying on the cutting edge of technology even with todays fast pace of change, so that the business you support remains competitive. This webinar addresses the basic building blocks you need to run like a business: defining services and offerings, layering in financial management and charge-backs/show-backs so you understand the costs of these offerings and how to pull it all together in a way that helps you run as a business does, even if it’s only on paper. Rob Akershoek, Solutions Architect at Shell and part of the IT4IT Forum, discuss the challenges and opportunities of running IT as a business. Running IT as a business is more than finances and cutting cost – it’s about IT quality. Today, simply meeting the service commitments of the business consistently may no longer be considered enough. Your business customers will over time have an expectation of increasing ‘value’ from their investment in the IT services you provide. Continual Service Improvement (CSI) provides an opportunity to exploit the insight, knowledge and skills of your people to identify and drive improvements to your IT services that add value to the customer and begin to positively influence their perception of getting value for money from their IT service provider. However, there is no value in CSI if the improvements provided are not focused on what your customer considers important to them. Equally, if the CSI improvements are not communicated to your customer and explained in a way that demonstrates tangible business value then this is a missed opportunity to demonstrate value and enhance customer satisfaction. In this session, we explore the essential ‘CSI Building Blocks’ required to ensure that CSI becomes a core capability for the IT service provider to demonstrate value for money from the IT services provided to their customers. The ‘CSI Building Blocks’ include the need to apply ‘Outside In’ thinking to your ITSM strategy, understanding the importance of purpose and contribution in motivating your people to drive CSI in the workplace, the importance of business measures to convey business value and the importance of a ‘target and tailor’ approach to customer communications. Endpoint security represents the frontline in your fight against cybercriminals. Despite the relative maturity of the endpoint security market, new threats and evolving attacker capabilities have proven traditional approaches inadequate - and left organizations exposed. Guest speaker Forrester Senior Analyst Chris Sherman and Nyotron's Senior Director of Product Management Rene Kolga will discuss the current state of endpoint security while highlighting a path forward for organizations looking to re-focus their strategies to combat current threats. With data breaches on the rise, enterprises worldwide are looking to implement better technologies and processes for faster breach detection and response, as well as train all employees to be cyber aware. Having a strong buy-in from the highest level of executive leadership in your organization is a key factor for a successful implementation of your CISO strategy. With high-profile breaches on the rise and a company's reputation at stake, cybersecurity is a top-of-mind issue for CISOs. The IT Specialist Network is one of the leading online networks with over 500,000 members and growing. Our speakers are leading IT professionals and executives with a wealth of knowledge and experience in the selection, evaluation and implementation of information technology.